The Spitfire Mark XVI was essentially a Mark IX with one notable difference - the engine. The Mark IX was powered by the Merlin 66 whereas the Mark XVI made use of the license-built Merlin 66 produced by Packard Motor Company in the U.S. These American-made motors were designated as Merlin 266 since the parts were not interchangeable with the Rolls Royce-made engine. The Mark XVI aircraft were all produced as low-altitude fighter (LF) versions but engine problems delayed introduction of the type into operational service. The Mark XVI was produced at the Castle Bromwich plant with the first example rolling off the production line in October, 1944. Part way through the production run, the airframe was modified with a cut-down rear fuseage and introduced a bubble canopy in place of the Malcolm hood and rear transparency for better all-round visibility. This bubble canopy modification was also applied to the Griffon-powered Spitfire Mk.XIV. Over 1,000 Mark XVIs were produced. 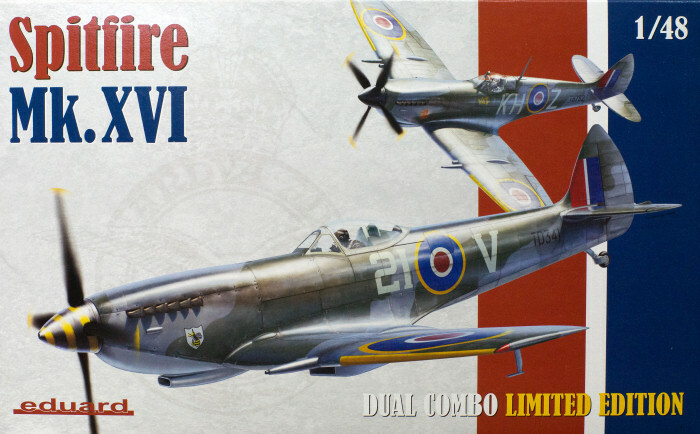 Here is Eduard's latest installment in the Spitfire story with the release of this Mark XVI and it features two complete kits in the box - one with the Malcolm hood and the other with the bubble canopy. 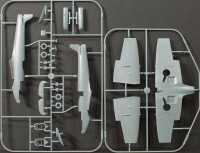 The kit is molded in light gray styrene and presented on nine parts trees plus two trees of clear parts. The surface detailing is finely scribed and the sprues do not show any sign of molding flash. The kit also includes two frets of color-printed photo-etched parts that provide some nice eye-catching details in the cockpit. Note that duplicate parts trees/frets are not shown. 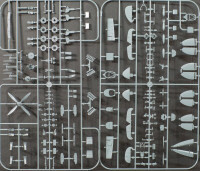 As you can see in the images, this set provides three sheets of decals, one each containing airframe stencils for the Malcolm hood and bubble canopy versions, and one large sheet with the wartime and post-war marking options listed above. This release provides both versions of the Mark XVI for your Spitfire collection and with the variety of optional photo-etch and Brassin details available for these kits, you can produce some very eye-catching subjects!